The Chapel of Adam is located directly below calvary—the place of the crucifixion of Jesus. 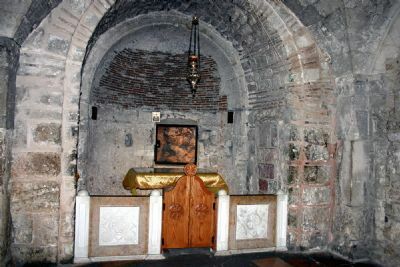 There is an early Byzantine tradition that the “first Adam” was buried below calvary and that the blood of the “second Adam” (= Jesus) wet the bones of the first Adam. In Greek Orthodox images of the crucifixion, particularly the removal of Jesus from the cross, the skull of Adam is represented below the cross of Jesus.